Insure your bets on the three-game Thanksgiving action with the NFL Parlay Bonus! Enjoy the turkey with an even bigger turkey, that is the NFL Parlay Bonus on the three select games scheduled for this Thanksgiving: Minnesota Vikings @ Detroit Lions, Washington Redskins @ Dallas Cowboys, Pittsburgh Steelers @ Indianapolis Colts. Make a three-team parlay on the Match Winner or Spread markets on the three Thanksgiving teams, and collect a cool 50% up to $100 Free Bet with the NFL Parlay Bonus! There’s really nothing to it! Bet on the hottest NFL action today and be rewarded for your betting efforts. Use the following Bonus Code for to claim the NFL Parlay Bonus: THANKSWINNING. Note: the NFL Parlay Bonus is open to players that reside in the US and Canada. It’s a long-standing Thanksgiving tradition to see the Cowboys and the Lions take to the field on this special day. No matter what, no matter how badly they have performed leading up to Thanksgiving, the Detroit Lions and the Dallas Cowboys have always been selected to play against other NFL teams. Detroit’s Thanksgiving game came about as a ‘marketing trick’ in efforts to boost its appeal in the 1930s – the first game was played in 1934 – and they’ve featured ever since. The Cowboys motives were no different, as they joined the Thanksgiving party in 1966 to see a spike in their popularity – since then they’ve only missed Thanksgiving action on two occasions. Place your wagers on the three-team parlay with the NFL Parlay Bonus and get yourself the 50% up to $100 Free Bet. This offer is valid only for today (November 24), so make sure to capitalize on it! Don’t let your bets go to waste this Thanksgiving; insure your bets with the NFL Parlay Bonus to collect 50% up to $100 Free Bet! 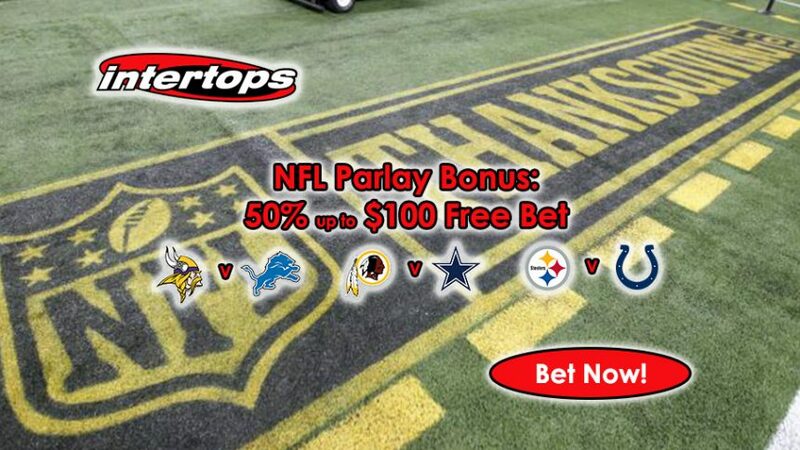 Claim the NFL Parlay Bonus today!